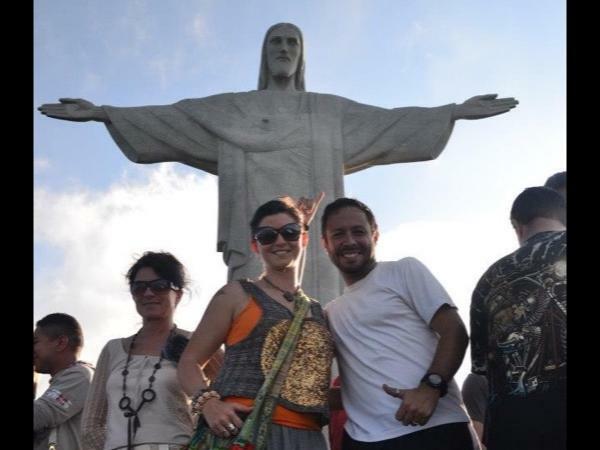 See the highlights of Rio "Sugar Loaf and Corcovado!" We enjoyed the two days tour with Daniel very much. Rio is a beautiful city. Our tour guide, Daniel is very knowledgeable and very patient. I highly recommend our tour guide Daniel. Daniel provided my party of four people with a first rate tour of Rio. He is personable an easy to talk with. Rio is a busy place and we felt comfortable with his knowledge of the city and getting us to our destinations safely. I would highly recommend Daniel to any friend or interested traveler I meet interested in traveling there. Thanks Daniel for a wonderful experience. Daniel was a fantastic guide. Knowledgable and flexible. Would highly recommend doing a tour with him. TOUR GUIDE RESPONSE: Thanks again for your great review my dear friend! Now I'm going to wait for the third round!! All the best for you and your family partner! Daniel was an excellent guide. He speaks excellent English and drove us all over Rio-we feel like locals now. Our photographers had wonderful opportunities to take great pictures. He chose a great spot for lunch- amazing meat and good beer. We had a really wonderful day in Rio and it was exactly what we asked for thanks to Daniel. I would recommend Daniel to any friend or family who wanted a tour in Rio. Daniel, was great guide for the four days of touring we did in Rio. Being a native, he was informative and quite knowledgeable on the city. He was caring and friendly, made sure our comfort and interests were met. We enjoyed a great and well routed tour in an enjoyable atmosphere throughout the day, which made our 1 day trip to RIO to one of our top highlights in Brazil! Many thanks again Daniel! Daniel Pedrosa took us, in his comfortable car, for a tour of Rio missing out the places we had already been to. Daniel is a Rio native and speaks perfect English so communication was easy. We saw Rio from several different directions but if there was somewhere we specifically wanted to go he was willing to go there. He is very kknowledgable about Rio and gave us all the information we required. A very pleasant and interesting trip and my wife and I highly recommend him. Excellent guide, excellent tour, good driver, super cool guy!!! We love Dany, he was very flexible as we changed our tour plan at last minute. Dany took us to see a his secret beach in Rio and many other amazing views! He gave us plenty of time wonder around and take pictures. Thank you Dany for the restaurant recommendations, we visited TiTi burger we loved it! We also went back to eat at the buffet by Sugar Loaf. You will always be part of our memories in Rio ; ). My wife and I really enjoyed Daniel. He was a pleasure to be around with a quick smile and pleasant conversation. His english was very good and he demonstrated great listening skills. I had asked him to pick us up in the morning from the airport and give us 4 hour tour (overview of the city) and then take us out that evening for a nice dinner with local dishes and a show. He hit a home run with us in everything he chose. I highly recommend Daniel. TOUR GUIDE RESPONSE: Thank you Carl!! I appreciate your review, My best wishes for you and your family. Great service from Daniel. He was very knowledgable and knew exactly how to get the best out of the spots we visited. You will not be disappointed with this tour! What an great day we had with Daniel in Rio. He was timely, considerate, and very approachable. He was very flexible when we decided to change our itinerary at the last minute. We learned so much about the culture, history, and out favorite, Brazilian food. We had lunch at an amazing neighborhood restaurant. When we go back to Rio, Daniel will be the first person we contact to schedule another amazing tour with him. Daniel was right on time, very professional and met all our needs. He was able to alter our schedule to avoid long lines and knew the city well. We had a great day. He was a very personable guide and we were glad to share our day with him. TOUR GUIDE RESPONSE: Thanks, Gordon! All my best wishes to you and your beautiful family !! Dan made our trip around Rio relaxing, interesting and made sure we saw everything we wanted to see. Nothing was too much trouble. We had booked Dan for two days and I would book with him again given the opportunity, a lovely man. Great day out, Cthe R is amazing close up and the views are great. Our tour guide was great, highly recommend this. Daniel was awesome! Knowlegable, friendly and very professional. Daniel is an expert on Rio, and he was thorough, engaging, relaxed. His English is great. Highly recommend. He spoke great English and took us to a wonderful night club, where we enjoyed Samba music and dancing. He took great care of us. A great time with Daniel! He provided an interesting and fun time that showed his ability to accommodate just what we were looking for in Rio's nightlife. Very professional and extremely competent! TOUR GUIDE RESPONSE: Thank Jeff!!!! It was a pleasure to meet such great couples from Virginia!!! Have fun for the rest of your stay in Rio!!! Enjoyable day and great to get out of Rio and see a different side of Brazil. Not touristy at all. Only suggestion would be for Daniel to have a cool box with water in his car and the tour price should have a small increase so entrance fees are included. Thank you Daniel and we will certainly recommend your services to anyone else coming to Rio. An outstanding time. Daniel went above and beyond expectations to make sure we had an amazing time. Unfortunately I had a fall on the ship and was wheelchair bound. Daniel was not phased and was so immensely helpful. He made our time in Rio delightful. I cannot speak highly enough of him. A joy to be with! Daniel was an excellent guide. His English was good and we all enjoyed his company. As well as showing us everything on the list, he also found us a supermarket. His driving was safe, I never felt uneasy and his explanations were good. If we needed more information, he was able to give it to us. I highly recommend him. Dan provided excellent service! We got to see all the places we wanted to see in Rio. Dan did a great job customizing the private Rio tour for us. Thank you! Highly recommend Dan!! Daniel was a great guide, I can't think of anything that we could have done differently to make our tour any better. He not only took us to the best touristic sites in Rio but also took us to his own preferred places, and my wife and I loved it all. He is very knowledgeable about the main attractions and how to avoid the crowd choosing the hours to visit each one precisely. He took us to lunch in one local restaurant and it was also an A+. If you know what you want or are not so sure Daniel is your guide! Daniel is an excellent tour guide. He is pleasant, flexible and extremely knowledgeable about Rio and the surrounding area. I would recommend Daniel to anyone wanting a truly professional guide. TOUR GUIDE RESPONSE: Thanks a lot John! !! Daniel provided us with a fantastic tour, tailored to our specific requirements, and at a reasonable price. We highly recommend Daniel, he will be able to provide you with a tour suited to any requirement. TOUR GUIDE RESPONSE: Thank you Jeff!! Hope you had a wonderful trip! My best wishes to you and your family, Dan. Great guide! Very knowledgeable. Prompt,courteous... Daniel made our trip! TOUR GUIDE RESPONSE: Thank you Clyde!! Always a pleasure to see my travelers happy! Daniel showed me around for my first visit to Brazil for 2 days & we went to see the classics of Rio with some special sceneries after I explained to him my personal interests (photo). He understood what I was looking for and he was able to adapt the itinerary to my wishes for the best. Great experience with Daniel, a smiling relaxed "typical" carioca, knowledgeable about the city history, best location to take landscape picture then open to share his opinions about life, his native city and his country. Dan was an outstanding tour guide who showed us some fabulous sights of Rio that were not on a cruise excursion we took the day before. He also imparted his incredible knowledge of Rio and Brazil, both historically, as well as modern day trends. Thanks so much, Dan, for a fantastic tour which I highly recommend!!! Daniel did an excellent job showing us around Rio - he was very informative. We enjoyed taking the subway and then felt comfortable using the subway during the rest of our stay. TOUR GUIDE RESPONSE: Thank you Caron! It was a great pleasure! Great tour and Daniel was on time and very helpful. He made suggestions and accommodated any requests we had. TOUR GUIDE RESPONSE: Thank you Nancy!! Great day with Daniel. He took us where we wanted to go and to some other places we would never have discovered. Good knowledge, info and suggestions for the remainder of our trip. We really appreciate his working is into his schedule at the last minute! Would not have been able to see as much as we did without him. Would definitely book with him again if in Rio. We had a wonderful trip to Petropolis with Daniel.. We discovered a lot of interesting facts about history of Brazil thanks to him. His English is perfect, he is also a very knowledgable guide, driving - extremely safe. Thank you, Daniel. We had a wonderful visit to beautiful sites in Rio with Daniel. He is pleasant, fluent in english and flexible. He switched the itinerary around based on our interests. I would recommend him highly in Rio. TOUR GUIDE RESPONSE: Thank you David! It was a great tour with a great "finale"! See you guys tomorrow! TOUR GUIDE RESPONSE: Thank you Jana! TOUR GUIDE RESPONSE: Dear Doyle! thank you for the 5 stars! Daniel took us all around the City center-- quite a lot of walking-- to a pay by weight lunch in an old part of town, to churches and to a wonderful monestary on top of a hill that not too many Cairo's know about. Not a good tour for people who do not want to walk....but we did. Plus he gave good advice about the mets system and where to go on our next days in Rio on our own. This was a very disappointing tour. The guide was friendly enough but not very informative and we had to prompt him to get information. We were left with the impression that he was simply going through the motions rather than trying to engage with us, and even our 'six-hour tour' was cut to five without discussion. Finally the car we travelled in was filthy. Previous experiences of 'Tours by Locals' in European cities have been excellent but this was really not of an adequate standard. Outstanding service, easy pace, very knowledgeable guide. TOUR GUIDE RESPONSE: Thanks a lot Ted! all the best you and your two "kids"
Daniel was a great guide. He was always prompt, courteous, offered many suggestions, and knew wonderful places to eat and see. We couldn't have had a better person to make our days in Rio the very best possible. Don't overlook adding a day out to the Imperial City....a real highlight for us. Daniel provided us a wonderful welcome to Rio. He was waiting for us when we arrived and quickly whisked us away and straight into a tour of the city. We were in Rio the week prior to the Olympic games and Daniel was kind enough to provide us a tour of the Olympic city and grounds. His knowledge was amazing! Daniel set the tone for what was a wonderful time in Rio. I highly recommend him, you won't regret it. Outstanding tour guide. Flexible and accommodating. Great sense of humor and very knowledgable about relevant subject matter. Highly recommended!!! TOUR GUIDE RESPONSE: Thank you Dace! Hope you had a good flight to Florianopolis, all the best for you,Chris and Fernanda. Daniel was an amazing guide. We would highly recommend! We spent a memorable day riding all over the city and visiting many of the major sights. Daniel was very knowledgable, friendly and welcoming. We felt lucky to have chosen him! There were 7 of us on this trip. Daniel did a great job, the weather was not the best but with his planning we were able to see all that needed to be seen. He customized a tour that was perfect for us, was always on time. He also gave us good recommendations for dinner. TOUR GUIDE RESPONSE: Thank you Lise! great family! Glad to deliver Roberta in safe conditions lol!! All the best for you. Thanks so much to Tours by Locals and our terrific guide Daniel. We challenged Daniel with a few unusual requests and he helped us out tremendously. Daniel was not only super knowledgeable about Rio, but also a pleasure. Ask for Daniel if you need help navigating the beautiful, and yes, somewhat confusing Rio de Janeiro. Obrigado! TOUR GUIDE RESPONSE: Thanks a lot Ray! I hope you ended up getting all the pics you wanted ! All the best for you guys! Daniel was a great guide. He setup exactly the tour of Rio that we wanted and took care of all the details. TOUR GUIDE RESPONSE: Thank you Michael, It was really nice to meet you and your friends, I hope you had a wonderful week in Rio and buzios as well. We took the tour with Daniel P as our guide and he was FANTASTIC! He was prompt and tailored the day to meet our needs and requests .He spoke excellent English and was very accommodating and offered valuable suggestions to make our tour memorable and very enjoyable. We would highly recommend him. Daniel was very personable and knowledgable. He took us to all the sites we had indicated we wanted to see and added a few of his personal favourites. We had a wonderful day! I would highly recommend this type of tour and this guide. ABSOLUTELY AMAZING!!! Daniel P was without a doubt the BEST TOUR GUIDE I experienced in my 10 days traveling through Brazil. He customized the tour for exactly what I wanted and made me feel completely taken care of. I had four days to spend in Rio. Daniel was flexible and accommodating and able to take my interests into account. He was also very fun and extremely knowledgeable. I HIGHLY RECOMMEND THIS TOUR GUIDE!!! Go to Petropolis, climb Tijuca, and definitely use Daniel! He picked us up on time. took us to see the beaches at the coast...then to sugar loaf he was very knowledgeable about the area He added a couple of things that were Extras to see on our way to the airport. Daniel is the best Tour guide I have had so far with tours by locals an A + His tour was very complete and informative. He speaks perfect English and also Spanish that he learned while living in Florida. But the best of taking a tour with Daniel is that he will make you feel your friend. We where at Rio during the World Cup and he went the extra mile to find tickets for us and help us with the logistics to arrive and leave the Maracana Stadium during the final match. You can't go wrong to book with him. If youre looking for a personalized tour of Rio - Daniel is your man! I initially had a hard time booking with Toursbylocals.com (it was during the World Cup! ), but Daniel more than made up for it. Also, we had a tough group - one very senior and one under 2 yr toddler - and he accommodated everyone. Even pushed the stroller! I highly recommend. Dont hesitate - book with Daniel - Before he is scooped up by someone else! This tour was excellent and perfect what me and my son needed. Daniel was a great guy. very friendly, helpful and informative. We got a great tour of Rio in one day. He navigated Rio traffic very well and new several shortcuts! Also took us straight to the Christ the Redeemer and used his tour guide credentials to get us in quickly. I highly recommend him! TOUR GUIDE RESPONSE: Thank you Maria!! hope you had a great flight back home and finaly had time to have a nice rest, you deserved it! VIVA MEXICO! We had an absolutely wonderful day with Daniel. We were planning a last minute trip and he was super accommodating. He met us at the airport and we had a 6 hr tour. It was very relaxing to know he was in charge do getting us safely to all our desired destinations. Daniel is extremely knowledgeable and has a wonderful sense do humor. We highly recommend him to all! Daniel was excellent, very personable , great English, very knowledgable of the area, even though he had travelled up to the statue and also to sugar mountain he toured it like it was new to him as well, we were a group of six from Canada and we would highly recommend him to any visitor to Rio! Thanks Daniel, from Geoff and the gang!!! TOUR GUIDE RESPONSE: All my best wishes to the "gang"!! thanks a lot guys! On time, very personable, suggested several "off the beaten path" locations that are not typical tourist locations. We only really wanted to see ' Corcovado' mountain and we asked Daniel to otherwise show us 'his' Rio, which he did. We thoroughly enjoyed his company and comments relating to life in Brazil. He definitely went the extra mile and showed us some interesting local sites. Having flown for many hours to arrive in Rio, the morning tour was our first meeting with Daniel, he quickly emerged as a very interesting intelligent tour guide and we thoroughly enjoyed our time with him. THE most amazing tour of Rio that we could have ever hoped for! We had one of the best days of our lives and one we will remember always. Very knowledgeable and thorough with a lot of attention to detail (Thank you Daniel). You won't regret choosing this tour or this guide. Definitely very worth the price and we recommend him to everyone! Great English too which made it easy for us! Daniel was an excellent tour guide. He was very accommodating and had a very good grasp of the history of Rio. I would highly recommend him. Daniel met us at the airport and identified himself. Our drive to our hotel was uneventful. TOUR GUIDE RESPONSE: Once again, thank you very much, all the best for the two of you. Our ship arrived in Rio in the morning and we departed via air in the evening. Dan gave us a personal, historical, and very real intro to Rio...through downtown and the Botanical Gardens, then Tijuca National Park (fantastic views and natural history), a coastal beach drive, then to the beautiful ceramic steps in Santa Teresa, ending up at the the stunning Parque das Ruínas and an art exhibit. The tour ended when Dan said goodbye to us at the airport airline checkin counter. What a phenomenal day! TOUR GUIDE RESPONSE: Thanks Matt!Loved my cap! Daniel gave us a great one day tour of Rio. We saw areas that tour buses never go and saw some different neighborhoods. He also arranged our transfers from ship to hotel and hotel to airport. We had a lot of luggage and this was done flawlessly. He is a friendly man who is easy to spend time with. I highly recommend him and his services. We could not have been happier with Daniel tour. He made Rio come alive with his knowledge and wonderful attitude. We give Daniel 6 stars for his tour. Daniel is very friendly and flexible. It rained all 3 days we were there and he switched our itinerary around to help us get the most of it. TOUR GUIDE RESPONSE: Many thanks for the 2 of you!! after that much rain I think we did a great job! Daniel was a fabulous guide! We were 13 people in the group varying in ages between 10 and 83 and he could relate to everyone. He took extra special care of Granny, whisked us past ticket lines, gave us a good overall view of the city and adapted to our needs. He kept us up to date with developments regarding the soccer stadiums and riots before our arrival in Brazil. He also gave us good insight into the Brazilian culture, economy and politics. Dan, we love you! A great walking tour of Rio with Daniel who was interesting, informative and obviously loves Rio and his job. Highly recommended. TOUR GUIDE RESPONSE: Cheers Martin!!! We spent 10 days with Daniel. He and the driver he hired were terrific. Our trip to Buzios was a highlight. I would recommend him highly. What a wonderful tour! Daniel was very prompt in contacting me to get an idea of what we wanted to see. He offered multiple suggestions based on our interests. Because we had only 1 day in Rio, Daniel planned our itinerary to maximize the number of sites we could see. We were very fortunate to see all we anticipated. At each site, Daniel gave a brief history and background. I will definitely contact him in the future! TOUR GUIDE RESPONSE: Thank you Karen!!! best regards to you and your friends,hope everything went well during your walk at Copacabana beach! see you next time! TOUR GUIDE RESPONSE: Thanks for the rating! Hope you enjoyed the city! Daniel was awesome and the Tijuca Peak tour was amazing. I've been to Cristo 3 times and Pao de Acucar 4 times, and this was no doubt better than both attractions combined. TOUR GUIDE RESPONSE: Thank you Kwaku! Hope you guys enjoyed the handgliding jump! all the best for you ,mom and the girls! Daniel took great care of us for the three days that we were in Rio. Though our flight was delayed a few hours, he was right there with a welcoming smile when we came out of baggage claim. Over the next three days, Daniel introduced us to amazing sights, showed us all around Rio and gave us wonderful suggestions for evening activities and shopping. Daniel has a great grasp of American language and culture, so was able to make us feel very welcome and explain things in depth. Thanks for a wonderful time! We had a very good time in Buzios. Daniel is a really good guide. Not only he explained all about Buzios, but also about Rio in general. He answered all my questions throughout the trip. Thanks, Daniel. Looking forward to another trip with you! TOUR GUIDE RESPONSE: Thanks Adrian! All the best for you and your dad! call me up if ever get back to Rio before you go back to Indonesia! hugs my friend! We had Daniel for parts of two days and would adopt him if possible. He was just about the perfect guide. He took us to all the obvious sites but in addition he took us to sites off the beaten track. We learned so much about Brazil, its culture and Rio that we feel we left the country with an exceptional knowledge of its people. Daniel is a treasure. TOUR GUIDE RESPONSE: Thank you Ron!!! All the best for you in California!